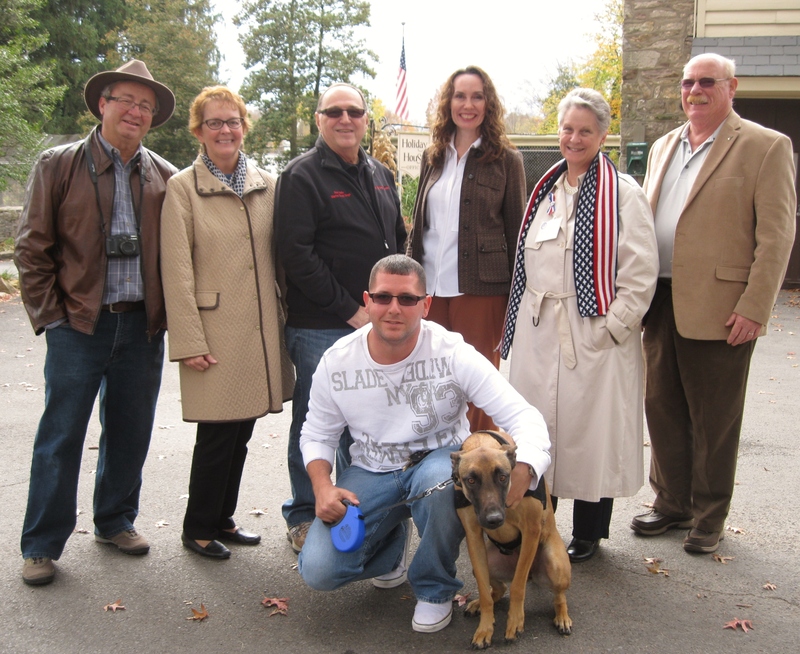 DOYLESTOWN, Pa., November 2, 2015—USAF Staff Sergeant Terry White and retired Military Working Dog (MWD) Hattie were presented with a year of free Hill’s Pet Nutrition prescription dog food during a reception to recognize the United States War Dogs Association (USWDA) at Holiday House Pet Resort & Training Center and Doylestown Veterinary Hospital. SSgt. 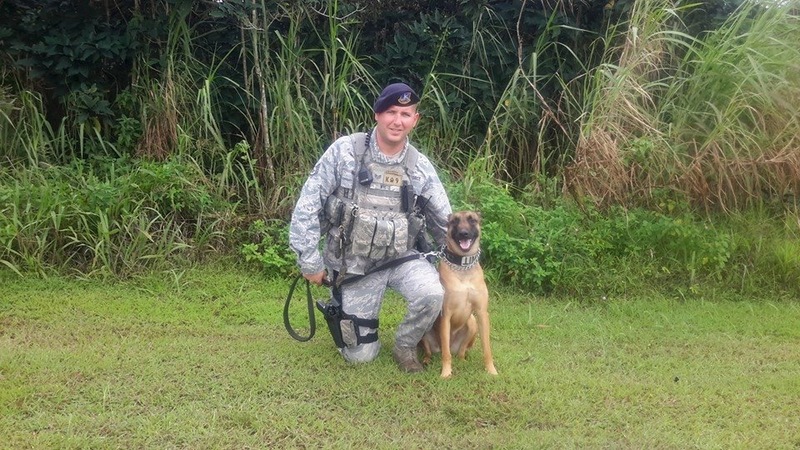 White and MWD Hattie served together in Guam from March 2014 to January 2015. Their job included detection of explosives, responding to bomb threats, and patrolling the jungles for poachers. SSgt White and Hattie in Guam. After Hattie experienced a loss of consciousness during long patrols in the heat, she was diagnosed with an irregular heartbeat. Hattie was eventually retired from active duty in Guam after SSgt. White was transferred to a new assignment. He was determined they would be reunited. The USWDA and Mission K9 Rescue helped with the adoption process and transport of MWD Hattie back to the United States. The reunion between the White family and Hattie took place in September at Philadelphia International Airport. SSgt White currently trains working dog teams at Joint Base McGuire-Dix-Lakehurst. “Hattie saved my life and now I can return the favor by taking care of her,” White remarked during the reception. Every summer, from Memorial Day through Labor Day, Holiday House Pet Resort and Doylestown Veterinary Hospital hold a fundraising campaign to support the USWDA and its Rx Program. This year over $2000 in donations were raised for the USWDA. When the Village Improvement Association of Doylestown learned about the fundraising effort, the Veterans Committee spread the word to VIA members and presented additional donations to USWDA president Ron Aiello. This year’s fundraising efforts included a raffle grand prize donated by Hill’s Pet Nutrition. The winners, Dan and Jean Upton of Chalfont, donated the prize back to the USWDA. Hattie was identified as an area retired MWD on a Hill’s Pet Nutrition prescription diet. The retail cost of the free year of food Hattie is on for her medical condition will save the White family over $900. Jean Upton is a member of the Village Improvement Association of Doylestown. “We have been working to create awareness and to raise funds for this organization for the past several years. This summer we optimistically increased our goal and we are thankful to our employees, clients and the community for their support and generous donations,” said Dr. Laura Weis, along with her husband Dr. Randy Weis, own and operate the pet resort and veterinary hospital. The donations benefit the USWDA Rx program for retired military and service dogs which provides free prescriptions. Many of the dogs require medications to help with pain management, inflammation, anxiety/PTSD, allergies, and other medical conditions. “These retired military dogs are usually adopted by their military handlers or other well-vetted families. Many dogs require costly medical care and prescriptions. Our free Rx program financially supports the families to provide the necessary care our canine veterans need. There are about 200 dogs currently enrolled and costs reach thousands of dollars every month,” said Mr. Aiello. The United States War Dogs Association supports military and retired war dogs as well as civilian canines retired from government contract work and law enforcement. Programs include raising funds and awareness for war memorials and service recognition, educational programs, corporate partnerships for specialty veterinary care, prescriptions, pet supplies and care packages, and transportation and adoptions services. The association is headquartered in Burlington, NJ with local chapters located across the United States. For more information about the organization, its mission, programs, and membership, visit: www.uswardogs.org. Mission K9 Rescue provides assistance and support for Working Dogs worldwide. The organization’s purpose is to serve retiring and retired Military Working Dogs, Contract Working Dogs, and other dogs who serve. The mission is to rescue, reunite, re-home, rehabilitate and repair any retired working dog that has service our country. The organization is based in Houston, TX. Located down a quiet country lane in Bucks County, Holiday House Pet Resort offers overnight luxury lodging for dogs and cats with activity packages, daycare, training, and grooming services. The facility is owned by Drs. Laura and Randy Weis, who also operate Doylestown Veterinary Hospital, a full-service AAHA-accredited veterinary hospital located on the same property. 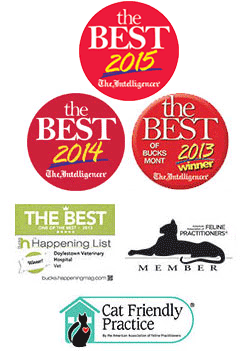 Holiday House Pet Resort was voted “Best of Bucks 2015” for Lodging, Grooming and Training and has been distinguished among the “Best of Bucks” since 2010. For more information about Holiday House Pet Resort, visit holidayhousepetresort.com and doylestownveterinaryhospital.com or call 215-345-6960.